He discovered that she had given up painting ten years ago and stored all her work in the attic – so he asked to see the paintings. ‘It was obvious that these paintings comprised a significant body of work, of range, contrast and accomplishment’. 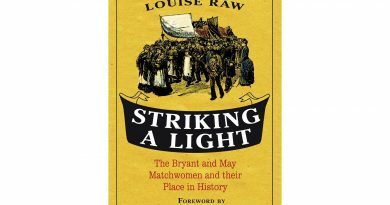 The Gentle Author photographed her work and publicised her paintings on his blog to enormous interest. Since then Fletcher has had her work exhibited in Townhouse Spitalfields by Fiona Atkins in 2016 and 2017, and in the National Gallery when she was shortlisted for the first Evening Standard Contemporary Art Award in 2017. 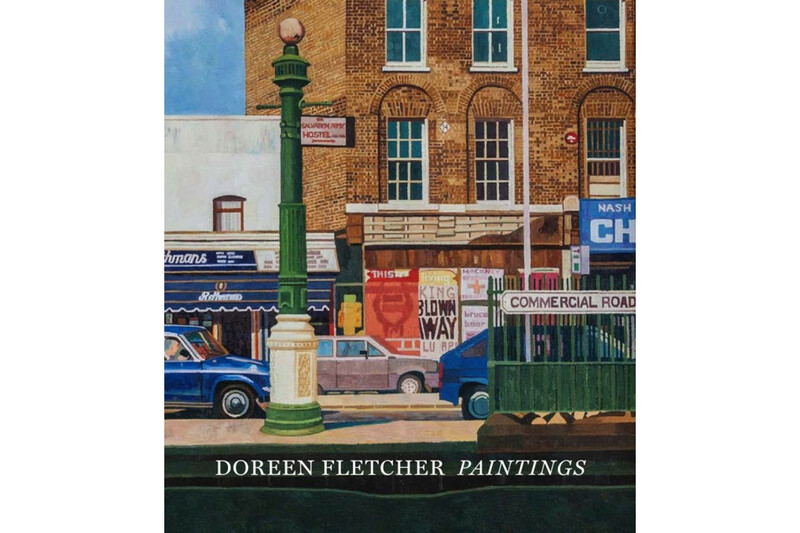 This monograph coincides with a retrospective of her work at the Nunnery Gallery, Bow Arts, which will display the whole range of Fletcher’s work from her early beginnings to the present day, as she is now painting again in East London and in France. The detailed depiction of the flowers in the foreground of this delicate drawing perhaps express some of that longing, which eventually brought her to London. 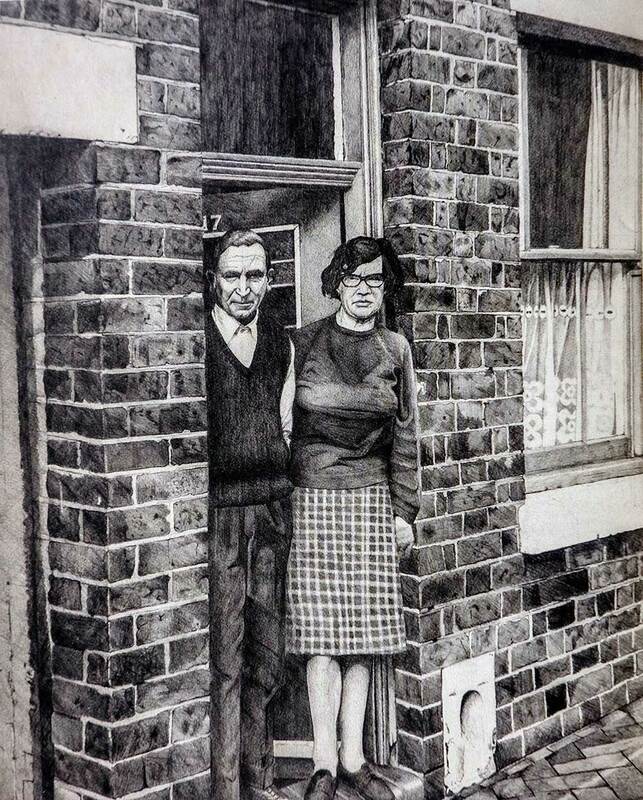 After studying for her foundation degree in Newcastle-under-Lyme, she moved to London with another artist and enrolled at Croydon College, painting full-time and paying her way by working as an artist’s model three days a week (‘the most boring job you could imagine’). Eventually she moved to East London to live and paint. 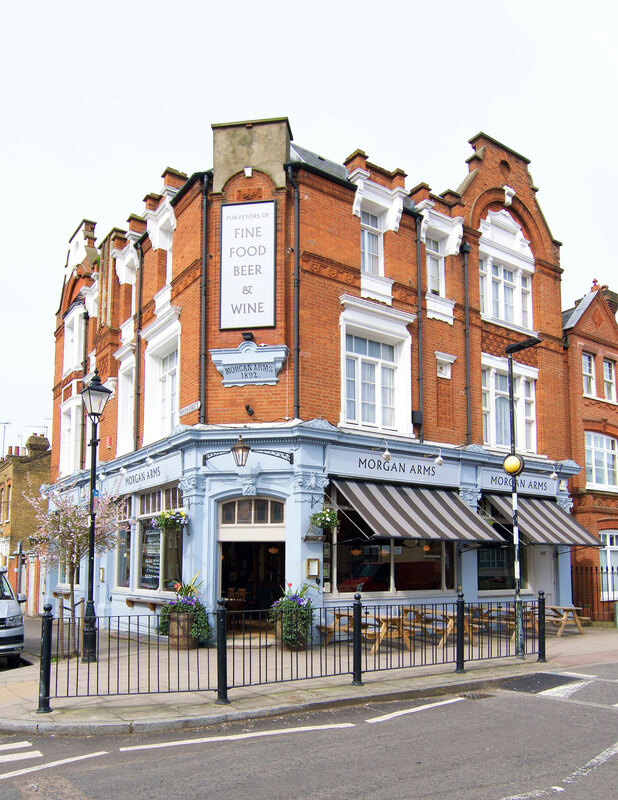 In the book she describes her first visit to Mile End for a date in 1983. 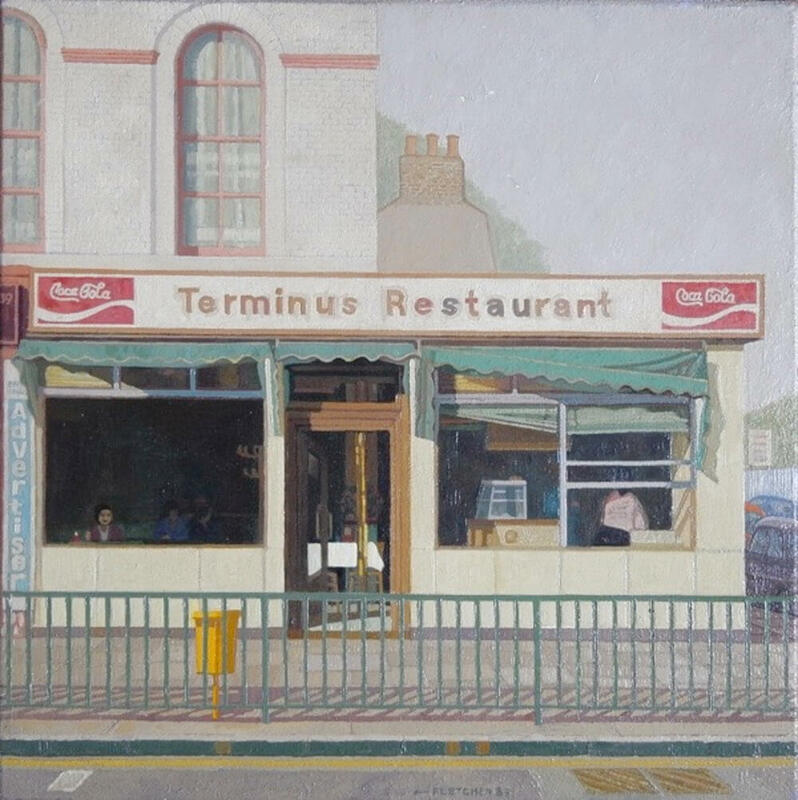 Near the station she found the subjects for three subsequent paintings, the first one being her Bus Stop, Mile End in 1983, one the Terminus Restaurant which she painted in 1985, and finally the nightclub Benjy’s which she painted in 1992. 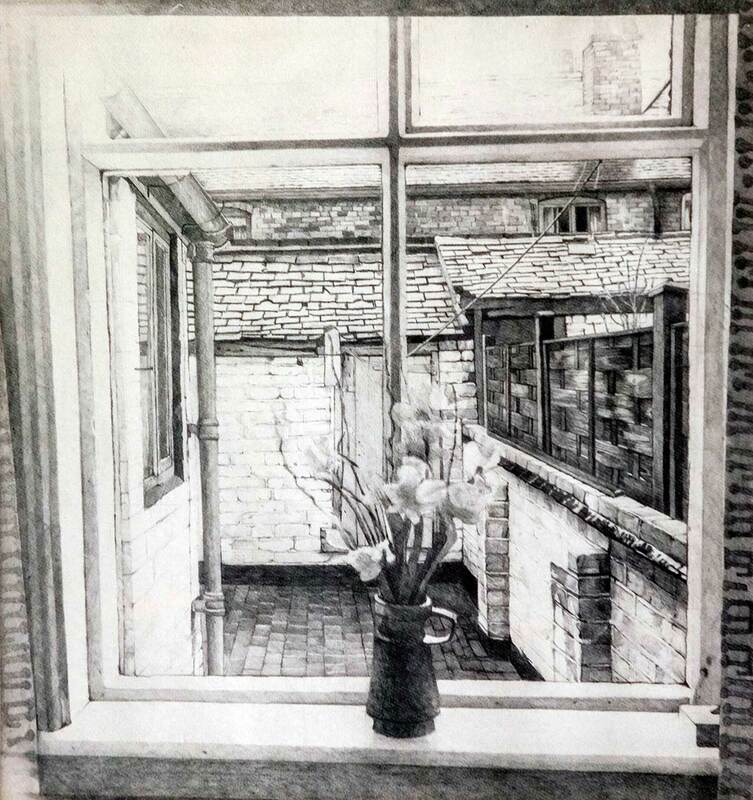 It’s Fletcher’s background, one could argue, coupled with her artist’s eye, that helps her see the beauty of these very humble, functional buildings that most of us would pass without a second glance. In ‘The Lino Shop’, Poplar, 2003, although the shop advertises ‘Fancy Goods’ the street as a whole is resolutely un-fancy, with its traffic lights, advertising and street lamps. But the sky above is lit with a glowing golden light, towards which some faraway trees seem to imploringly lift their branches. It’s like one of those moments when you are walking on a London street and look up momentarily to the sky and catch your breath. 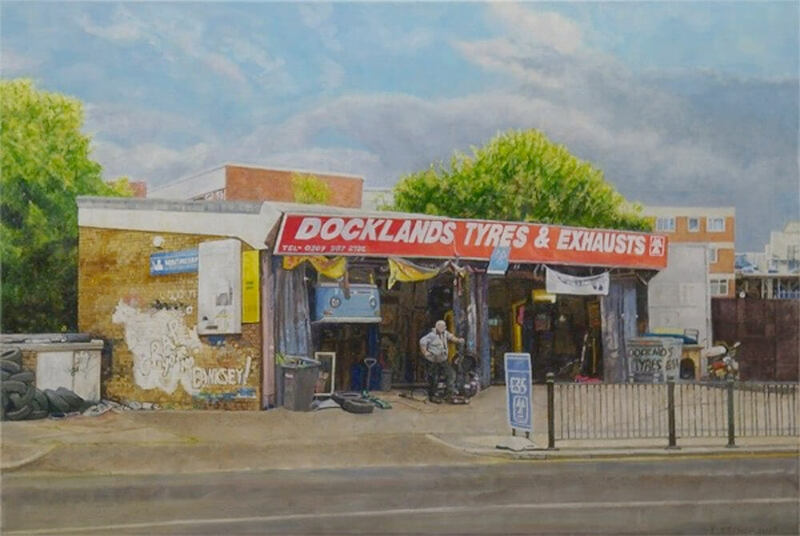 But Fletcher’s work captures so many of these little moments, contrasts of light and shade and flashes of bright colour which illuminate the everyday, with paintings from Limehouse, Poplar, the Isle of Dogs, and Bethnal Green. 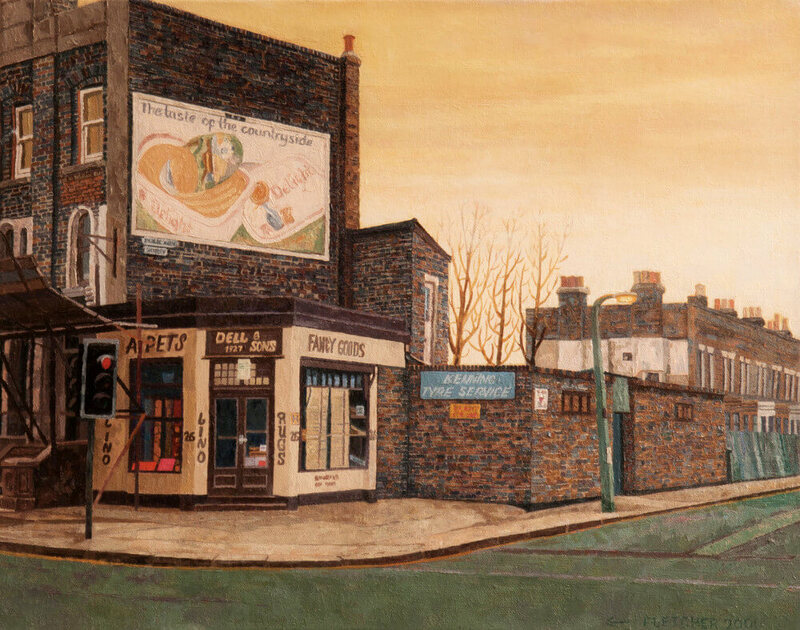 The paintings come to an abrupt end in the early 2000’s, by which time she had become thoroughly disheartened both by the lack of real appreciation of her work and by the many changes occurring in East London, including development and gentrification. ‘I remember the day I made a conscious decision to pack away my paints. It was November 16th, 2004. I said,’ That’s it! I am not going to paint again.’ She was to continue with her resolution for over a decade – until the time the Gentle Author approached her, and she showed him her collection of works stored in the attic. ‘Your no Banksey’, Limehouse, 2017 reflects Fletcher’s constant interest in graffiti and the urban landscape in general. The setting is a tyre shop, the proprietor isn’t working on the van in the shop but taking a break, standing at the front looking to the right. Above the shop is another beautiful sky – blue, with thunder clouds massing in the distance. It’s a moment in time – and perhaps also, an ironic, tongue-in-cheek reference to the artist’s own feelings about the contemporary art world that ignored her for so long.